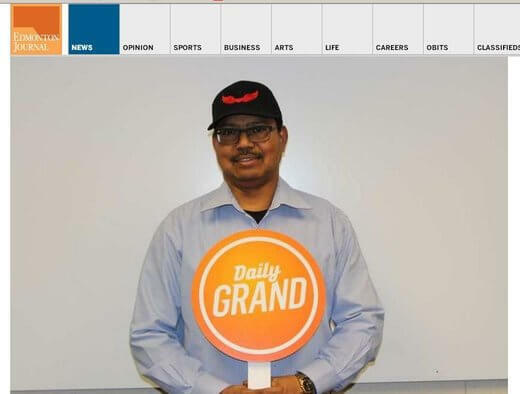 A man from Edmonton has just won the grand prize of the lottery’s new Daily Grand game. The top prize is a cool $1000 a day for life or a single payment of $7 million. Suryanarayana Bora bought his lucky ticket at the Petro Canada gas station at 895 Tamarak Way NW. After the Nov. 10 draw, his $9 investment in the ticket gave him the top prize. The lucky winner says he is very happy that the money means he can take care of his family. His priority though is paying off his mortgage and other outstanding bills. The Western Canada Lottery has just launched the Daily Grand game last 18 October, and the Nov.10 draw was only its 7th. An Edmonton resident is bringing home a one-time payment of $7 million after becoming the first winner of a new lottery game dubbed Daily Grand. The winning combination is 1, 11, 16, 46 and 48 with the “grand number” of 5.